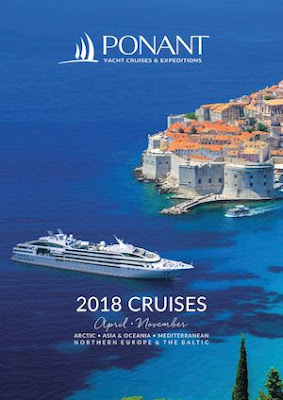 The new April - November 2018 PONANT brochure, in addition to new routes to be discovered, highlights two important events: the 30th anniversary of the company which was founded in 1988 by Jean Emmanuel Sauvée, its current President, and the arrival of the first two yachts out of four in the series of PONANT EXPLORERS. In 2018, PONANT will celebrate its 30th anniversary. 30 years of cruises under French flag across all the world’s seas, 30 years of ports of calls in some of the least-known places on the planet, 30 years of magnificent moments for our passengers. To mark this anniversary, the company has prepared two exceptional itineraries, which recall two of the most emblematic regions of the world for PONANT, the Ponant Islands and Polynesia. 2018 will also see the arrival of the two first sistership yachts in the PONANT EXPLORERS series. Measuring 128 metres long and with just 92 Staterooms and Suites, all with a private balcony, Le Lapérouse and Le Champlain will set sail on their maiden seasons in Northern Europe and Mediterranean, from June and September 2018. Contact your travel agent, or PONANT on Australia: 1300 737 178 or + 612 8459 5000 / New Zealand: 0800 44 32 62, or email reservations.aus@ponant.com to request more information, a copy of the brochure or assistance.